Regular bathing is important for all children. 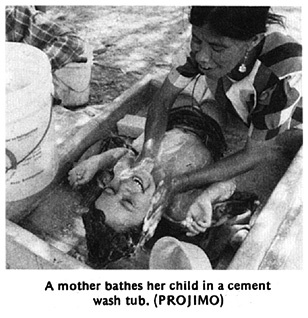 Bathing the severely disabled child, however, is often not easy. Children whose bodies get stiff or whose knees pull together may be very difficult to clean. As the child gets older and heavier, the difficulties often increase. Here are some aids and ideas that may make bathing easier. For the baby or small child, some kind of a tub may be a big help. IMPORTANT: Talk or sing to the baby as you bathe her. Tell her each thing you do, and the name of each body part you wash, even if she cannot understand. A child must spend a long time listening before she can say her first words. So get an early start. As the child grows, make every effort to help her take part in bathing herself. Help her do more and more until she can bathe herself without help, if possible. Our goal in bathing is SELF-CARE, even for the child who is fairly severely disabled or retarded. For many children balance is a problem, even while sitting. Anything that can help the child keep his balance, and stay in a position where he has the most control, will help make bathing easier. Here are some aids and suggestions for helping the child manage better. The child who has trouble sitting because she stiffens backward may need some kind of back support to sit while bathing. CAUTION: Be sure water is clean and does not spread disease. Especially for the child who does not have good bowel or urine control, it is very important to carefully clean herbutt and between her legs. An inner tube on poles, like this, holds her in a good position for washing. A soap mitt, made of a piece of towel and a tie string (or Velcro straps), lets the child who has difficulty grasping use both the washcloth and soap more easily. Bath time is a good time to help a child develop many different skills. Encourage her to handle and play with toys in the water, repeat words, and imitate actions. Let her feel the difference between a sponge and a cloth, or dry and wet and soapy. To learn to use both hands together, let her squeeze water out of the sponge. To help the child learn how to bathe herself, let her first wash her toys and dolls. Show her how and encourage her to copy you. For a child who is afraid of the water, letting her bathe a doll or toy first may calm her fears. Toys that float in the water make bathing more fun. Use corks, bits of wood, or plastic bottles with lids on them. Making little boats with sails or 'paddle wheels' makes it more fun and helps the child learn to use her hands better. The child with weak lips or who drools can play by blowing the boat across the water. For the child with limited control or strength, it is often easier to play in the water with toys that float than it is to play with toys out of the water. Drying the child can also become a game that aids development. Rub the child, sometimes gently and sometimes briskly, with a rough cloth or towel. Name the different parts of her body as you rub them. Remember, as you bathe and dry the child, talk about each thing you do-or sing a song about it! Move the towel with the music, and encourage the child to move with you. Use your imagination to make it more fun and to help her learn. Use bath time as an opportunity for learning and play. In children who have poor mouth and tongue control, food often sticks to gums and teeth and is not cleaned away by the natural movement of the tongue. Many disabled children (even those with no eating problems) are fed soft, sticky 'baby foods' long after they should be eating rougher, more solid 'adult foods'. So, their gums get soft, weak, and unhealthy. Sometimes children with disabilities are 'spoiled' by giving them extra sweets-which increases tooth decay. For these reasons, we must take care to keep the gums and teeth of the disabled child healthy and clean. Avoid foods and drinks with lots of sugar-especially between meals. Start child on solid food as early as he can take them. Toast, crackers, carrots, raw fruit, and other foods that rub the teeth and gums clean are especially helpful. Clean the child's teeth and gums, if possible after every meal. Before the baby has teeth, clean his gums with a soft cloth over your finger. First, dip the cloth in boiled water with a little salt or baking soda in it. This is a good position to clean the child's teeth and gums. Be sure the head bends down. If his head bends up, he will be more likely to choke or gag. After the child has teeth, clean them with a small, soft toothbrush. Or use a piece of thick cloth or a bit of towel wrapped on a stick. Or use a stick from a Neme tree or other non-poisonous plant. Toothpaste is not necessary. Instead you can use salt, salt mixed with baking soda, or a burned and powdered piece of bread, chapati, or tortilla, or just water. Clean all surfaces of the teeth well, and also rub or brush the gums. Help the child learn to do whatever she can to clean her own teeth and gums. At first you can guide her hand, then have her do a little more each time, and praise her when she does it well. REMEMBER: Brushing the gums is just as important as brushing the teeth! For more information, see Where There Is No Dentist, Chapter 5, "Taking Care of Teeth and Gums" (see Page 637).